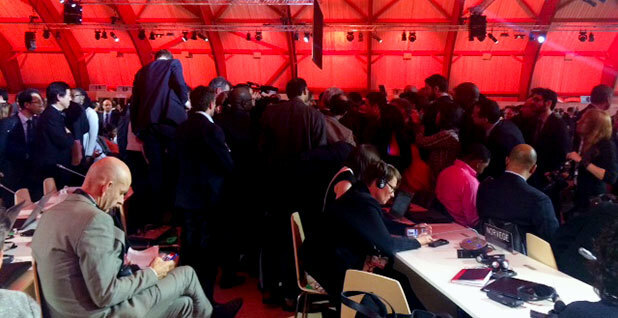 Some frantic "huddles" occurred among diplomats near the end of the Paris climate negotiations. One of them involved a dispute over the difference between "shall" and "should" in the approved text. Photo by Lisa Friedman. LE BOURGET, France -- Before America would join its first-ever global climate change accord, before the gavel would fall and the cheers and the tears and applause, before top U.S. negotiator Todd Stern would dance the night away with his staff at a Paris nightclub, there was a word to be fixed. Buried on the 36th line of the 21st page of the agreement was the word "shall." The U.S. team insisted it was a clerical error and demanded that the French conference president fix it to "should." Or, they said, they'd walk. First, the Obama administration felt, it would bake into a new deal the strict division between actions of rich and poor countries that the United States had fought so hard to dismantle. More importantly, it would have made cuts for developed nations legally binding and forced the deal to come before the GOP-led Senate for approval. But some countries were fighting to keep it, and others demanded consultations to be sure the United States wasn't pulling a fast one. In the end, after two plenary floor huddles -- one between senior negotiators from Venezuela and China, with Europeans crowded in at the edges, and another near the stage between Kerry and Chinese lead negotiator Xie Zhenhua with Stern, French Foreign Minister Laurent Fabius and his climate ambassador, Laurence Tubiana, gathered in close -- the change was agreed to by all. Kerry, walking back to his front-row seat, could be heard telling people things would be starting soon as former U.S. Vice President Al Gore took selfies with fans. Shortly after 7 p.m. local time, Fabius instructed a clerk to read out a list of typographical errors. By the time she zipped through the seemingly simple "shall" to "should" change, few people in the sauna-like plenary hall noticed the relieved glances exchanged by longtime activists and State Department staffers. When Fabius declared the agreement adopted, cheers rang out, building to a crescendo until he officially gaveled it through at 7:26 p.m. With that knock of wood on a table, almost all the countries of the world had agreed to a historic accord that experts say won't in and of itself avert dangerous levels of global warming but will steer the planet toward a decidedly cleaner future that will back steadily away from fossil fuels. "We met the moment," President Obama said in a statement. "Today we can be more confident that this planet is going to be in better shape for the next generation." The Paris agreement is, by most accounts, an ambitious one. It calls for countries to prevent global temperatures from rising more than 2 degrees Celsius (3.6 degrees Fahrenheit) over preindustrial levels. It also says countries will "pursue efforts" to keep the temperature rise lower, to 1.5 degrees Celsius, a key ask of island nations and other vulnerable countries. To achieve it, countries aim to peak their emissions "as soon as possible" and to start cutting carbon rapidly thereafter "in accordance with the best available science." And while targets submitted by 187 nations -- including, at the last minute, Venezuela -- are not enough to avert dangerous warming, the deal demands improvement by forcing countries to update their current pledges by 2020 and every five years thereafter. The United Nations will periodically "take stock" of the pledges, beginning in 2018, to measure countries' efforts against the goal of keeping global average temperatures below the 2 C threshold. A common transparency system for developed and developing countries -- something dear to the United States -- was agreed upon to help ensure countries would do what they say they will, with some flexibility for poorer countries. Where money is concerned, countries agreed to continue mobilizing $100 billion annually through 2020 as promised at the 2009 Copenhagen, Denmark, climate summit and to establish a new scaled-up target by 2025. Developing countries are "encouraged" to give money on a voluntary basis to poorer ones. "I think this agreement is good. I think it can make a difference," said Jennifer Morgan, who directs climate policy at the World Resources Institute, as she waited for the final plenary to begin. Offered a front-row seat next to the daughters of U.N. climate chief Christiana Figueres, the 21-year negotiations veteran said she was trying to hold back her emotions. "We have to get through this first," she said. Getting to the moment of nearly all countries embracing a global climate deal took 20 years of U.S. engagement, disengagement and then re-engagement. It took four years of intense diplomacy since nations vowed in 2011 to launch the Paris process and visits by French leaders to more than 140 nations. But the last few hours have been known to make or break many a U.N. climate conference, and this one was no different. Around noon Saturday, before the final text was even out, Fabius and French President François Hollande led nations in a rousing call to action, telling them that their "moment of truth" was at hand. Figueres, who had told friends she would wear purple on the final morning if things were going well, but then mistakenly wore it the previous day, left those in the know trying to decode her mauve turtleneck. Diplomats left the room in high spirits as lines queued down the hall to pick up hard copies of the agreement that many hoped would be quickly adopted. Then the Americans spotted the "shall." Word began to spread that the United States had a problem. Another round of shuttle diplomacy began as Kerry met with Xie, Indian Environment Minister Prakash Javadekar and others. U.S. negotiator Stern would later describe it to ClimateWire as a "small fire," saying it was the first appearance of that word after several drafts and clearly a clerical error. "That word had never been in play at all," he said. "That was from the file of 'Whatever can go wrong, will.'" He described the afternoon as "running around trying to reassure people who have a history of skepticism that this wasn't some special deal being done for the U.S." The word wasn't the only holdup. African nations wanted special recognition about the vulnerability of their continent, opening up the possibility, some worried, for every continent to demand something similar. Nicaragua was unhappy with everything. When Fabius called countries back in to adopt the measure, disagreements still had not been settled. Indeed, some thought the United States was getting a special favor. Asked if he thought the agreement would be adopted as diplomats streamed inside, Gurdial Nijar Singh of Malaysia -- who leads a group of oil countries and India fighting to keep strict divisions between rich and poor nations -- said, "I think so, unless the U.S. objects to its own draft." When it was all over, Singh, walking out of the conference hall with his suitcase, pilloried the change. Shall, he said, was his group's "super red line, and they knew it. Then of course, John Kerry didn't like it, so everyone must change. The U.S. gets what it wants. That's the reality." But as the huddles broke up and the corrections were made and Fabius gaveled the deal through, anxiety turned quickly to elation. Cheers thundered in the hall. Activists hugged. Diplomats cried. Gore and Kerry were asked to sign people's copies of the agreement. Hollande told the crowd, "Later, when people ask when was the beginning of our lives, what did we achieve? You will be able to say, 'On the 12th of December 2015, we were in Paris for the climate agreement,' and you will be proud to stand before your children and grandchildren." The agreement was embraced by China and India -- Javadekar called it "a new chapter of hope" -- and Europeans took special pride in the deal. Kerry declared it "a victory for all the planet and future generations." Recalling the terrorist attacks Paris suffered in November, Kerry said, "France, in the most difficult circumstances, after loss of life and terror, stood proud, stood up, stood strong, set an example to the world." 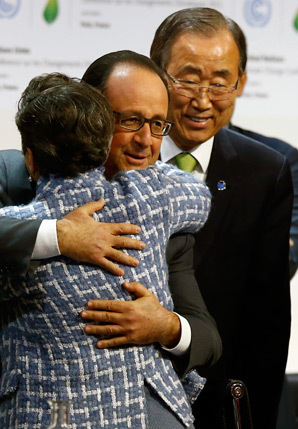 As the climate deal emerged on Saturday, French President François Hollande hugged U.N. climate chief Christiana Figueres as U.N. Secretary-General Ban Ki-moon looked on. Photo by Francois Mori, courtesy of AP Images. Even Venezuelan Ambassador Claudia Salerno, known for leading the charge against the Copenhagen Accord in 2009, when she banged her hand bloody to make her objection heard, called it a "historic moment" and offered a peace offering: her country's emissions targets. "Everybody remembers me from Copenhagen," Salerno told a laughing audience, adding, "We have done so much better six years later." Andrew Light, a State Department staffer who has been working on climate change for 15 years, choked back tears. "I can barely keep it together," he said. "I never thought it would be this good. It's just amazing." Ana Unruh Cohen, who directs energy policy for Sen. Edward Markey (D-Mass. ), was worried she was going to tear up again when asked her reaction. "My daughter will be the age I am now in 2050, and I think a lot about what the world will look like. Given what we did tonight, I think she's going to have a chance at a pretty amazing world." Stern, speaking by phone from Washington, D.C., last night, said the significance of countries agreeing to a deal, which he has worked on for the past seven years in a climate career that has spanned two decades, didn't sink in until well past midnight at a dance club where activists were holding a celebration. Stern said he hadn't planned on joining the revelry. As he was eating hotel bar food with staffers a few hours after the deal was done, bed seemed like the place for him to be after three successive near all-nighters. Then, he said, an aide told him, "OK. So you'll go to the party the next time you sign the most important climate agreement ever?" That changed his mind. Once inside, Stern was deluged with handshakes, back pats and requests for selfies. He said he was "blown away" by the reaction. "It was a very happy moment," said the ever-understated Stern. "A cool moment."